Last night I made a dinner that really went over well with Pierce. I got out some small cookie cutters. 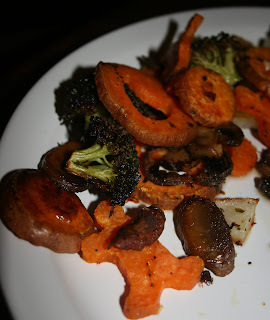 Sliced sweet potatoes and cut out their centers as gingerbread men, moons, and stars. 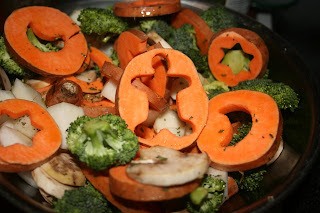 Threw in some broccoli, mushrooms and turnips. Tossed with olive oil, salt, pepper and parsley and roasted at 425* for 25 minutes. Pierce ate every bit! He had fun working the sweet potatoes like puzzles. And I was happy he got such a good dose of veggies. Not to mention they were delicious; I think I'll be doing this more often. I've had kind of a lousy day. I backed the minivan into our Saturn this morning, ripping off a side view mirror and leaving a big scratch. I remembered my pump but forgot some of my pumping supplies so I had to go all 6.5 hours of class without pumping at all. And I haven't gotten a run in yet! Hopefully tomorrow will be a better day. I have 3 dozen cookies to bake for a cookie exchange the local Multiples Club is doing.